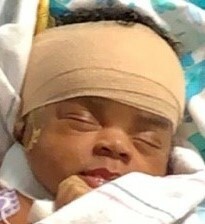 Miracle Kalia Lynn was born on February 13, 2019 at UAB Children’s Hospital, to Cameron and Deja Lynn. She gained her heavenly wings on March 25, 2019. Miracle will be remembered by her big sister Jalia Lynn. Miracle was truly loved by many and her precious memories will be cherished by her loving grandparents, great-grandparents, a great-great grandmother, aunts, uncles, and cousins.